The National Restaurant Association privately commissioned GOP pollster Frank Luntz and his company LuntzGlobal to poll Americans on their support for raising the minimum wage, a policy they staunchly oppose; that poll has now leaked, and it reveals a nation that stands in solidarity with low-waged workers, with 71% of Americans supporting raising the minimum wage to at least $10, even if they have to pay higher prices as a result. The NRA has used the threat of higher restaurant bills as its key talking point in arguments against raising the minimum wage. The poll reveals that this has backfired, with Americans deciding the the fundamental fairness of paying a living wage trumps their desire for low prices. 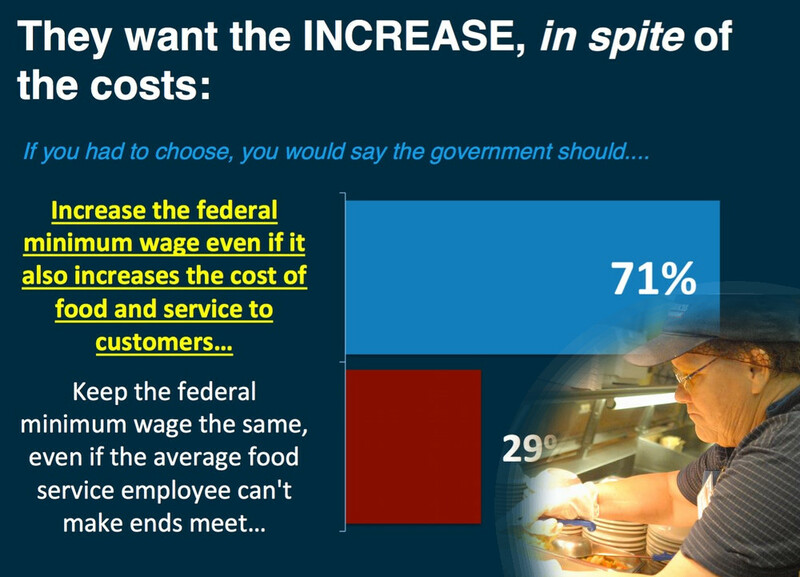 Even though the Luntz survey shows that restaurant customers are willing to pay more, the leaked poll shows the messaging that the NRA is continuing to deploy to try to stop measures to raise the minimum wage. That includes the claim that restaurants will go out of business if the minimum wage goes up. That is, the NRA’s argument disregards its own survey results that customers are willing to pay higher costs to support a higher wage for their neighbors.